1. cast on with magic cast on 16 x 16 (16 on each side of the magic cast on, total 32 stitches) or fewer on each side if you want a longer, pointier toe. increase every other row as described in the magic cast on technique until you have 60 stitches. i knit using magic loop on a 2.5mm addi turbo circular, but you can use dpn’s or two circulars if you prefer. 2. knit foot as for sodera socks, but substitute the chart above. 3. when you are about 3.5 [<-- edited to correct this] inches away from the length of your foot, start the gusset increases as described in baudelaire, following the 60 stitch size (smallest). continue and then follow the heel pattern from baudelaire. 4. for the leg of the pattern and cuff follow sodera but stay with the chart pictured here above. 5. choose a nice colored ribbon (i usually wear one that is bright blue, shocking i know, blue and black, who could have guessed that from me?) and use some flat elastic (sold as underwear elastic) in the cuff as described in sodera. these are a long project but work wonderfully in dark solid colored yarn. i used an inexpensive black superwash sock yarn that came in 100 gram skeins (mondial ciao), but i really wanted to use regia silk. none of the local yarn stores had more than two 50 gram skeins of black regia silk from the same dye lot. one sock used 62 grams and the other 63, for a total of 125 grams. i wear them quite often as i tend to wear black knee-length skirts almost as often as jeans. the ravelry link for this project is here and all the project photos are here. Viel Spass! 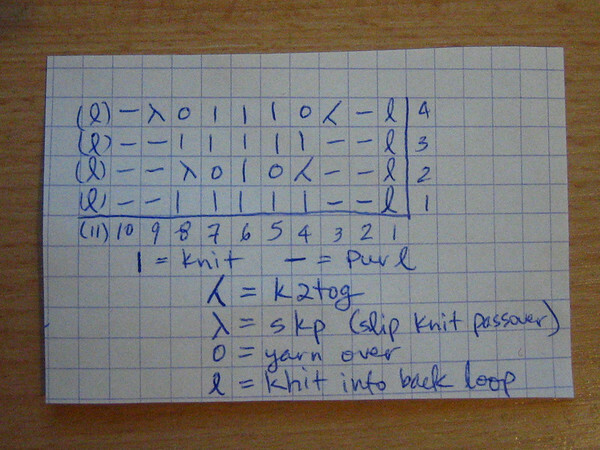 This entry was posted	on Wednesday, November 7th, 2007 at 11:59	and is filed under knit. You can follow any responses to this entry through the RSS 2.0 feed. You can leave a response, or trackback from your own site.